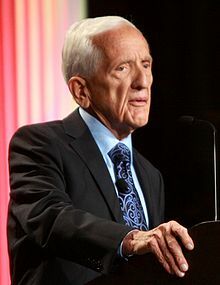 T. Colin Campbell (born, January 1, 1934) is an American biochemist. He works in the effect of nutrition on long-term health. He is the Jacob Gould Schurman Professor Emeritus of Nutritional Biochemistry at Cornell University. Campbell has become known for his advocacy of a low-fat, whole foods, plant-based diet. He is the author of over 300 research papers and three books, The China Study (2005, co-authored with his son, Thomas M. Campbell II), which became one of America's best-selling books about nutrition), Whole (2013) and The Low-Carb Fraud (2014). Campbell featured in the 2011 American documentary Forks Over Knives. Campbell, T. Colin, and Caldwell Esselstyn, Jr, MD. "Forks Over Knives: How a Plant-Based Diet Can Save America". Huffington Post, May 13, 2011. Campbell, T. Colin. "Nutrition: The Future of Medicine", The Huffington Post, October 25, 2010. Campbell, T. Colin. "Low Fat Diets Are Grossly Misrepresented". Huffington Post, September 28, 2010. ↑ Interview with T. Colin Campbell, author of "Whole", philly.com. Parker-Pope, Tara. "Nutrition Advice From the China Study", The New York Times, January 7, 2011. Also see Bittman, Mark. "Tough Week for Meatless Monday", The New York Times, June 29, 2011.